Its time for my Weekend Warrior post at Inkspirational and this week we have this wonderfully romantic card by Marina for you to CASE. I was inspired by the bold lettering and was going to go for a Love theme but as I started create another idea came into my head......I would make a card that I could use as a love card or for a number of other reasons-congratulations, Happy Anniversary etc. I did this by combining my Tech Talk CAS-ual Friday Stamps with a sentiment and heart from a Fresh Squeezed Stamp set. 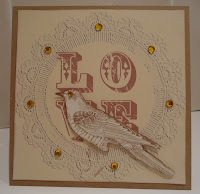 I stamped the heart directly onto the card base then stamped another one and covered it with glossy accents, fussy cut it and mounted it on a foam pad to give dimension. This month Eclectic Anthology are our sponsors. Before you get inky don't forget to take a look here at the fabulous projects our DT have come up with. Sandie, This is awesome...I LOVE the way you combined the sentiments! Great take on th challenge. Clever girl! I do love cards that can be used for several purposes and for both men and women - and this is such a card! Clever design! Very clever and fun, Sandie! Two gorgeous cards and perfect for many occasions. Thanks for playing along at Aud Sentiments. Wow! Your CAS card is great. I have little talent for CAS and I admire people like you who do it so well! Hi Sandie, I LOVE the bold graphic look of this card, great colours too - the red popped up glossy heart is such a sweet detail!